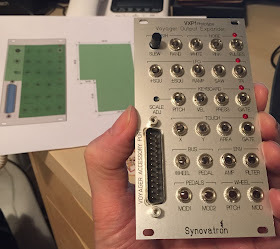 The online home for my synth projects, ideas and Synovatron products. VXP1 and VXP1-OS are now available off-the-shelf directly from Synovatron for £180.00 GBP (excluding delivery and VAT) so if you are interested ping an email to synovatron@btinternet.com for price/payment details. 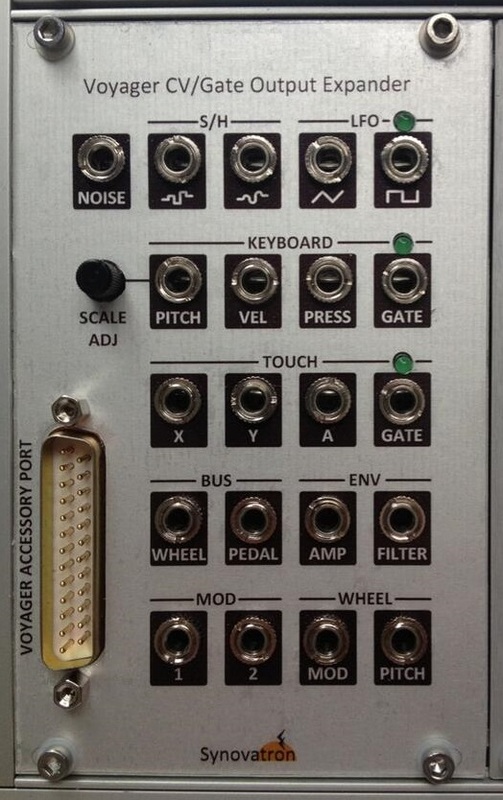 A few years ago I designed and built a Eurorack interface for my Moog Voyager. I built it in a week to take to the Brighton Modular meet to see if there was any interest in such a module. 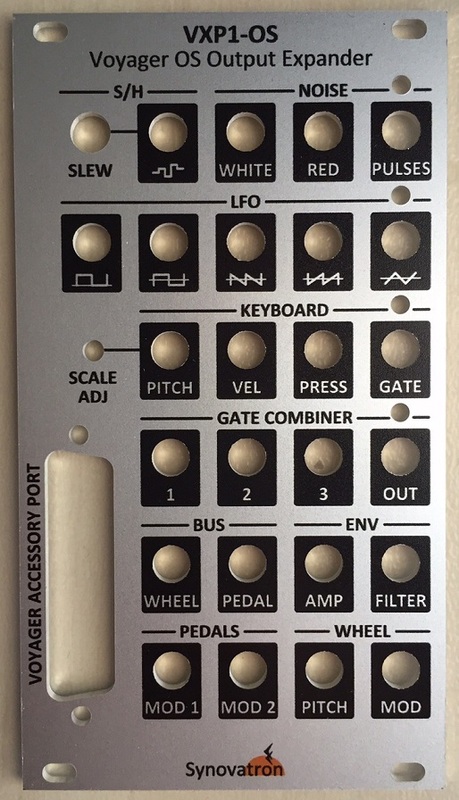 I have a Moog VX-351 which is a perfectly lovely bit of kit but I wanted something that had 3.5mm minijacks to make it easier to use with my Eurorack and Roland 100m modulars. 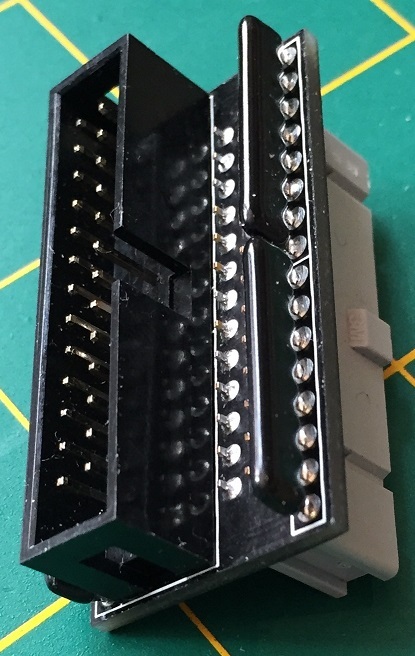 The module I built was a simple breakout panel that had one jack per signal available on the Voyager's Accessory Port (a 25 pin D connector). Most signals were wired straight through but one or two included active electronics to provide scaling to give a more useful 5V range, in particular Keyboard Pitch had a scaling amplifier and a trimmer to set it exactly to 1V/octave. LEDs with driver circuits were also added to the LFO and the two gate signals. Most modular users don't have a Voyager (and sadly it's now out of production) so I didn't get too much interest at the Brighton meet but I did get some interest on Twitter and Muffwiggler and in particular from one wiggler whose frequent enquiries about its development has spurred me on to develop it. It has been very slow going due to a number of reasons (not all connected to the module itself, the real world has a way of changing one's focus!). 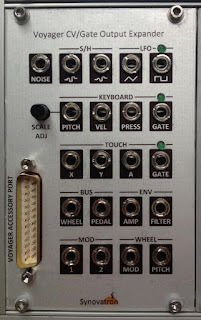 One reason for procrastination was due to an error in Moog's design of the Voyager's Accessory Port which was not suitably buffered; which means that when a cable is connected to the port some of the signals become unstable and oscillate. Moog's remedy for this was to use a small adaptor board that has to be retrofitted inside the Voyager between the main circuit board and the Accessory Port's ribbon cable (this just affects backlit types, not the Old School version). The Output Adaptor is a small circuit board that adds a 330 Ohm resistor in series with many of the signals; here is a link to an installation guide. The 330 Ohm resistance is enough to isolate the capacitance of the extra cable length which maintains amplifier stability (ED Note: If you want to understand about amplifier stability then this series of 5 short videos by Analogue Devices is the perfect intro, in particular video 4 which describes this problem nicely. Ideal for anyone designing with op-amps). All signals are filtered, buffered and have the necessary gain and drive to give more Eurorack-friendly output levels. 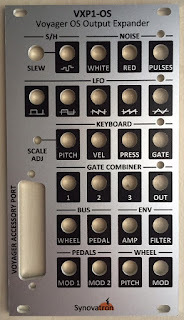 The smooth and step Sample and Hold outputs are replaced by just one output and a variable control to give an adjustable slew to Sample and Hold. There are more LFO waveforms: ramp, saw and 10V clock. There are more noise options: white, red and random pulses. The panel is narrower than the first prototype: 16HP down to 14HP. 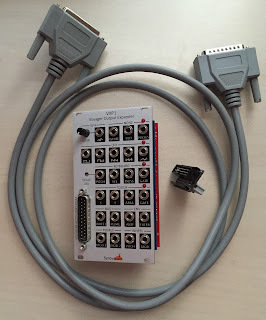 For Old School Voyagers which don't have a touch panel the VXP1-OS has repurposed the redundant TOUCH sockets to become a 3-input gate combiner. Any update on availability & cost for the VXP1-OS? Thanks for the enquiry - the VXP1 and VXP1-OS are available now. A small production run has started and the first few of each type are tested and ready to go. The price is 190GBP + shipping + VAT (if applicable i.e. UK/EU). Please contact me with location details and I will quote the all-inclusive price and payment details. I have an RME and a 351, but not a 352. 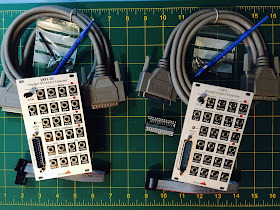 I am quite interested in getting or making a eurorack module that incorporates both of these modules, as they are pretty unweildly and I am up for getting into eurorack and using the RME as a rack mounted controller. 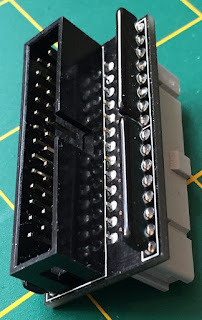 I am guessing that the simplest way would be to buy this module and do a DIY job on the 352, which leads me onto the question of whether it is a straightforward pinout to socket job for me, or needs some extra engineering/ scaling? I am also not a fan of having the DB25 connector on the front of the units as it gets in the way - was this necessary in your design of the VXP1? I would be happy to lend my RME for testing too (London based). I understand that it does not require the adapter board from what I have read online. I would like to order one of these. Will you ship to the US? I don't see where I can purchase one. I'd like to buy one as well. Hey, very much interested in this if it's going to be ordered again! Yep! Awesome! If available I put myself in list. Bravo, bravissimo! Thanks Pete, hopefully you got all the info you needed. The XL looks pretty awesome. 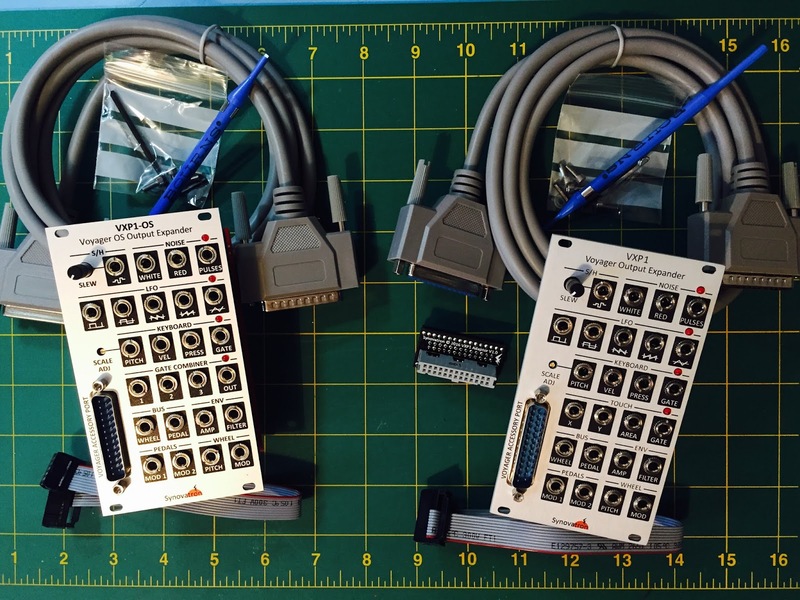 Can I purchase an output expander adaptor and ribbon cable assembly from your site? I assume my aluminium voyager will require one and I purchased my VX-351 second hand without the adaptor.